August and It’s Hot, Hot, Hot! Okay, I obviously have not been posting anything about my garden since, (Let’s see, March?). I can’t believe how long it’s been and it’s not due to not having anything to say, but sometimes…there is just nothing interesting going on. Gardens or in my case “landscape”, are always changing with the seasons and due to little rainfall this past winter, spring was not putting on much of show in my garden. 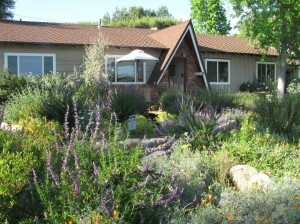 Yes, the Douglas iris’, Penstemons, and of course the ubiqus California poppy bloomed and so did everything else. But over all the amount of flowers were less than in previous years but still beautiful anyway. I guess the most exciting thing was to find a dead rattlesnake a few months ago, right where I have two chairs under an umbrella. Now I have no idea how it ended up there, but it was a little bit unnerving, needless to say. It’s extremely hot this week and rattlesnakes will naturally be out and about but not in the middle of the day. Typically, they will find a shady spot under a bush or rock and wait for things to cool down. Caution prevails, here at my house. I’m not about to be putting my hands or feet in the target zone for their fangs. Well, it is now March and usually by now it’s quite common to see many wildflowers blooming along our roadsides but this year is different. There just has not been enough rain this past winter and that means there will not be a display of wildflowers for the average person to view from their cars as they travel down a road or freeway. I have a tendency or radar, to be scanning the slopes and open areas along roadsides and the freeway, looking to see if there is anything to catch my eye that says spring has arrived. I manage to not drive off the road but if there is a place for me to pull over and park, I will and investigate what has got my attention. 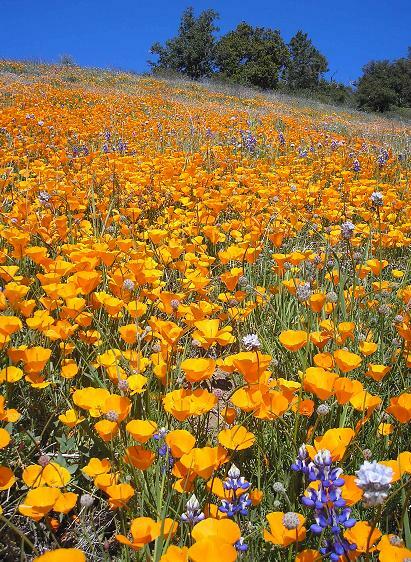 Usually we begin to see displays of California Poppies, the state flower, along with a variety of Lupines ( Arroyo Lupines) that are seasonal and can generally be seen from the road with dark purple flowers and dainty tips of white on each blossom. I have seen some California Sunflowers/Encelia californica on the hillsides, putting out their bright yellow flowers from green shrubby plants, but that’s about all I have seen and it’s disappointing to me. I have found it necessary to do some supplemental watering in my own garden to offset the lack of rain. And many plants are blooming although it looks like the Margarita BOP’s are not going to have too many flowers this time around. But the Woolly Blue Curls/Trichostema lanatum look fantastic with deep, blue flowery stems, the Channel Island Poppy continues to show off and many of the sages are blooming as well. Search for her beauty today and everyday, because it is to be found everywhere you look and you don’t want to miss viewing something that just might make a difference in your day. “Oh What a Beautiful Morning…..
Oh what a beautiful day…..I’ve got a beautiful feeeeellllinnnng! Everything’s going my wayyyy”….Okay, so I guess who ever is reading this, knows this is my attempt at singing the song from the musical comedy, “Oklahoma”. 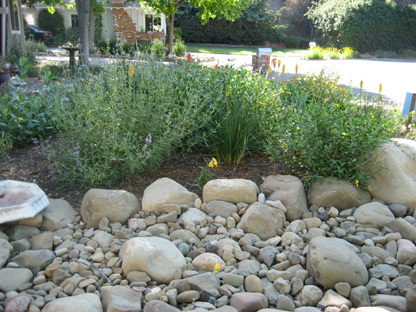 And what does it have to do with native plants, gardening, habitat creation and other aspects of life? At least my life? Probably nothing other than it is a beautiful morning and as morning gives away to the afternoon, there are implied promises that the day will continue to be inspiring. It doesn’t take much for me to be happy and I just completed spreading out four bags of mulch which gives my garden a neater look, especially since this year I won’t have the usual display of wildflowers. And that is because it hasn’t’ rained enough to encourage the seeds to sprout but there will be plenty of California poppies putting on their best colors as they daintily slip off their slender, green overcoats. And they never disappoint and can be counted on to show up and show off.. 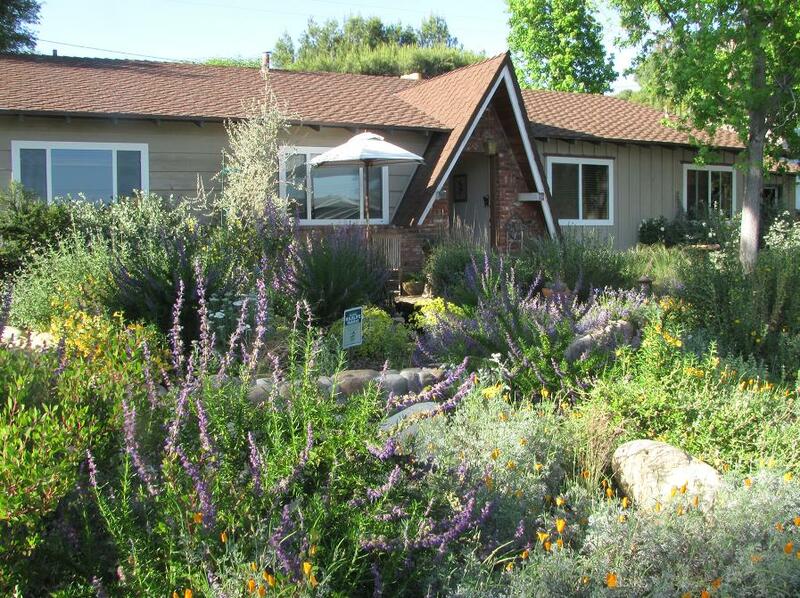 I am so far behind on writing regularly here and I do want to share some of the notes that I took while attending a class at the Theodore Payne Foundation for Wild Flowers & Native Plants…a few months ago conducted by Barbara Eisenstein on the exciting topic of irrigation. Then there are those times that when I just simply fail when I try to do something such as digging up, dividing and transplanting some of the Douglas Iris’. Most of them died but failures are to be expected in life and it’s best that we take them with a smile and learn something from them. Although the ones that I gave to my daughter-in-law are apparently doing just fine. Or at least that is what she’s telling me. Maybe she doesn’t want me to know she killed them, too. I guess the song from” Oklahoma” is saying that no matter where you are, no matter what you are doing, no matter how scared or hopeless you may feel, the sun is always raising somewhere and that includes your heart.